The Other Side blog: Monster Monday! Yog, The Monster from Space! It was my pleasure to meet Natasha Duncan-Drake and her sister Sophie Duncan in last years A to Z Challenge. They both posted a lot of great stuff and plenty that can be used in any game. Well Natasha has started a new feature. 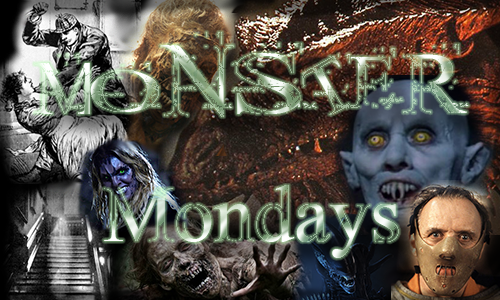 Monster Mondays. You might recall I did something similar here for a while and there are other blogs that also do this. MindweaverRPG has done a few, so has Dispatches from Kickassistan, and I know there are others. I like Tasha. She is cool, so I am happy to get behind this monster monday. Plus I love monsters. Since I am talking about Sci-Fi games all week how about a sci-fi monster. And no space monster is loved more here than Gezora from Yog, The Monster from Space! Is a giant (100ft/30meter tall) squid controlled by the "Space Amoeba" Yog. Gezora usually attacks a planet, but can be transported through space. Gezora, Yog and other kaiju are the "stars" of "The Space Amoeba" aka "Yog the Creature from Space". Gezora can walk on land, swim in the ocean and travel through space. While it has 10 tentacles it can only attack with 2 of them. Any natural 20 attack roll means that Gezora has grabbed onto a victim and will swallow it whole. Attacks: 2 attacks with tentacles, 4d8x2. Swallows whole on a natural 20. Monster Monday is a great idea. And that is a very weird looking monster. Thank you so much for joining in :) Now that is one odd looking beastie and it seems very versatile - land, sea and space! I don't think I'd like to meet Geroza.